The Chivers 1900 hull scored very well in the 2010 Boat of the year competition, performing brilliantly in the atrocious weather conditions nature laid on for the judging days. I was more than happy to revisit the hull in somewhere between cuddy and runabout form, with a thoroughly revised layout and in slightly better conditions. There was still a lot more wind and bigger seas than most people would choose for a fun day out, but the 1900 Thresher coped as well as ever. 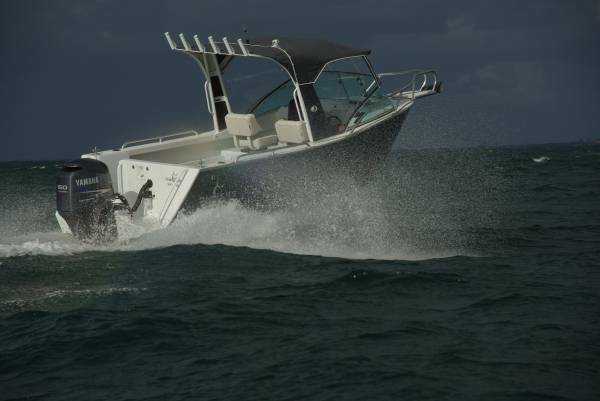 Like the other boats in the shark series the 1900 has a fine entry and a sharp deadrise – not as sharp as the larger boats, but 20-degrees is more than respectable. To cope with that figure, coupled with the unusually broad beam for a 5.8m boat of 2.4m, the 1900 needs its flooding keel to ballast it down when not actually moving. And it works well: our shark became an extremely steady boat within seconds of putting the motor into neutral, well capable of supporting three anglers at a rail. Within no more seconds of putting it back into gear and opening the throttle the ballast tank was drained and we were riding high. And fast: the 150hp Yamaha four-stroke gave abundant urge to what, despite solid construction including a 5mm bottom, is a light boat. 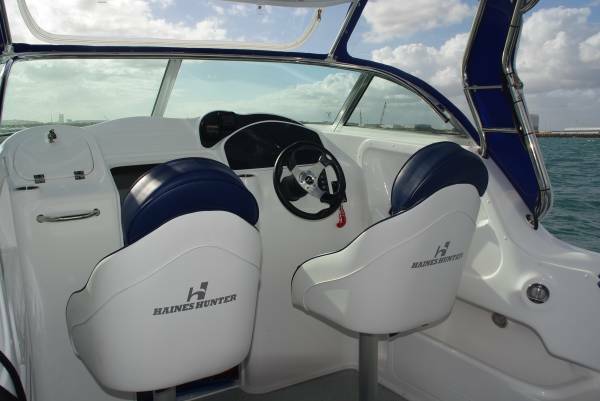 The two main seats are well matched to the boat’s characteristics, giving supple rather than soft support. Both swivelling and sliding, they sit on locker boxes. Standing is just as comfortable as sitting, with plenty of hand-holds and the controls well placed. 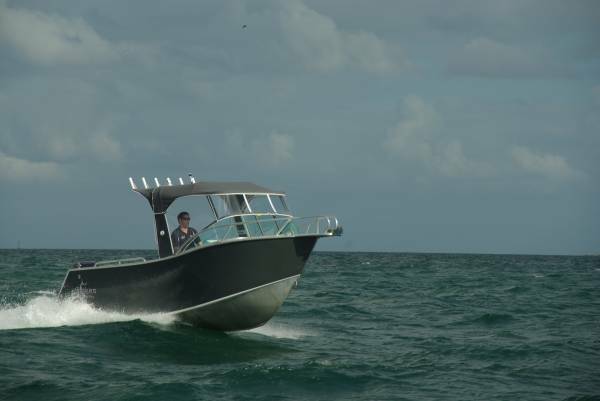 The Bimini has good fore and aft cover – but still with the rod holders right at the rear – and is probably high enough for a two-metre basketballer. For the benefit of standers, the Bimini’s side supports are carried enough to not interfere with vision. The dash works well for a driver in either position. The section above the wheel is carried above the scuttle and is well raked forward, providing enough area to swallow a 10-inch screen and giving it good visibility. The review boat had the Yamaha triple digital displays alongside that area, and there was room left over for a range of other displays. The vertical section below the wheel carried the radio and had room for a stereo and a switch panel. A lot of thought went into the details of this section of the1900. One outstanding bit is the recessed dash. The principle is usual with current runabouts, allowing easy handling of the anchor via the opening windscreen centre, but few are as refined as this. The recess is curved instead of square and, to further pamper the belly of the anchorer, it has a large section edge to it. The anchor cable too is pampered – or rather the bit of hull it touches. Chivers was a pioneer in leaving bare of paint any edges liable to abrasion, but goes that bit further here: the anchor cable well is carpet lined. So obvious, for noise as well as wear suppression. 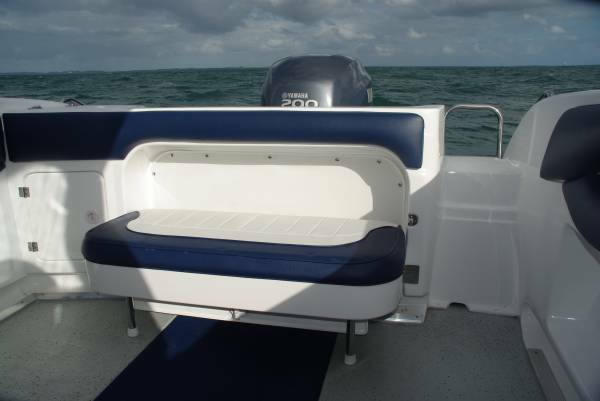 There are simple seats for two more – probably the upper number for fishing trips – on an upholstered locker top at the transom. This houses the twin batteries, a great contribution to safety. 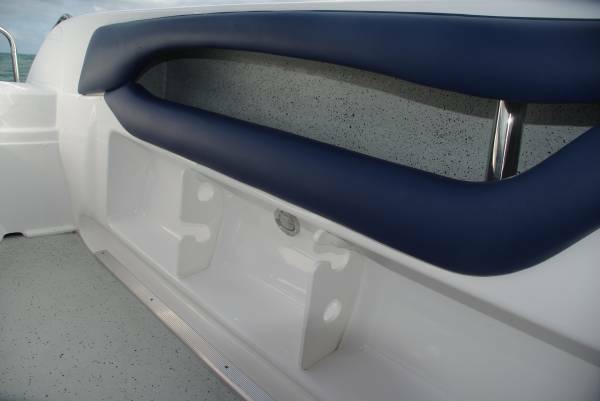 Other storage spots include the long side pockets and below the bunks under the foredeck. They could be bunks for children, but really are seats within shelter; certainly they have sitting headroom. The fore and aft under floor framing makes natural boundaries for tanks, and the 1900 is generously provided with a pair of 140L catch tanks – big enough for dive gear and fitted with gas lift struts - and a 180L fuel tank. This has a filler aft of the transom, mounted on the centerline to suit filling from a bowser on either side. Trailing weight is 1500kg on a heavy duty tandem trailer. Genuinely rather than nominally heavy duty because customers for this boat often select the less well-travelled tracks, and at the end of them make beach launches. And in case diving is the occupation instead of fishing, Chivers offers a choice of two or three-rung scuba ladders instead of the conventional kind.